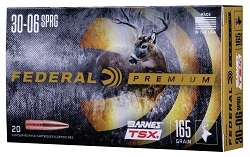 ANOKA, Minnesota - Federal is bringing back its hard-hitting, exceptionally accurate Federal Premium Barnes Triple-Shock X rifle loads. Shipments have been delivered to dealers. The immensely popular all-copper hollow point bullet groups tightly at long range and delivers consistent, lethal expansion. The monolithic design retains more than 99 percent of its weight on impact to penetrate deep, and its grooved shank minimizes barrel fouling and improves accuracy.